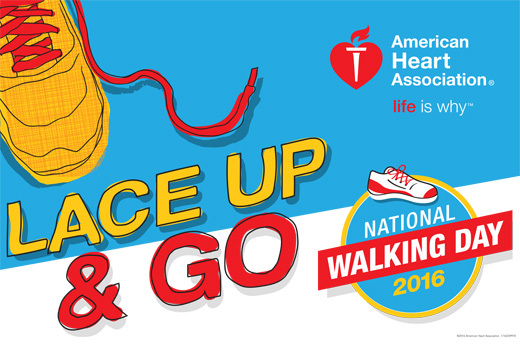 Healthy Emory will join the American Heart Association in celebrating National Walking Day on Wednesday, April 6. All Emory Healthcare and Emory University employees are invited to participate in a 30-minute fun walk, guided by one of the Healthy Emory wellness champions. • Visit the schedule of 30-minute walks to find a walk at your location or if you’re on the Clifton campus, join the kickoff for the spring walking group at Lullwater Preserve at noon on Wednesday. • Bring your sneakers and join a walk on Wednesday, April 6. Emory Saint Joseph's Hospital employees are invited to attend the ribbon-cutting at noon for the unveiling of the new walking trails. • During your walk, take some selfies and post your photos to social media using #NWDEmory. • Pledge to increase the amount of physical activity you enjoy each day! The American Heart Association recommends at least 150 minutes of physical activity per week for adults and 60 minutes per day for children and adolescents to promote good health and to help prevent heart disease, stroke, diabetes and other chronic diseases. One of the easiest ways to get moving is to lace up and go for a walk. For more information on National Walking Day events, or if you would like to launch an official Healthy Emory walking group at your site, contact wellness specialist Curtis Williams.